We dove into the world of Legos about a year ago... and its been a quick descent in the absolute depths of Lego mania. We have more Legos than I ever wanted Finley to have--and they are his main motivator to do just about anything. They are his reward for anything we need him to do. 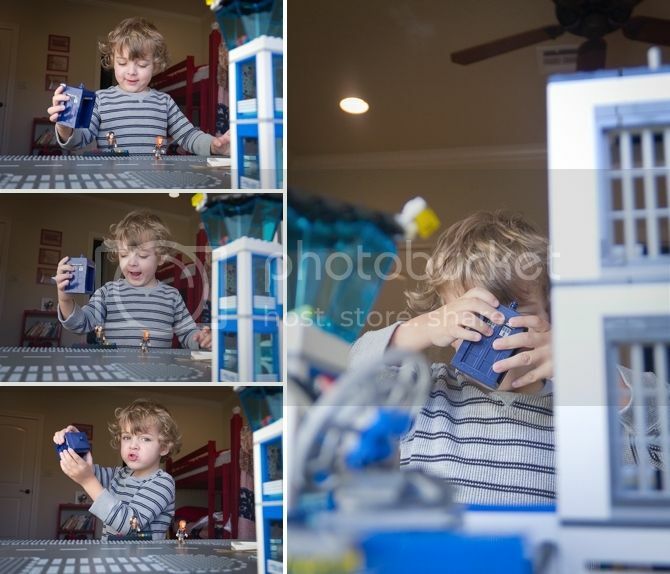 Which has become kind of an expensive form of bribery, as he's pretty good about getting himself to do anything when Legos are on the line. I told him he could have a Lego set when he could buckle himself into his car seat--and he figured it out pretty quickly once Legos were promised! 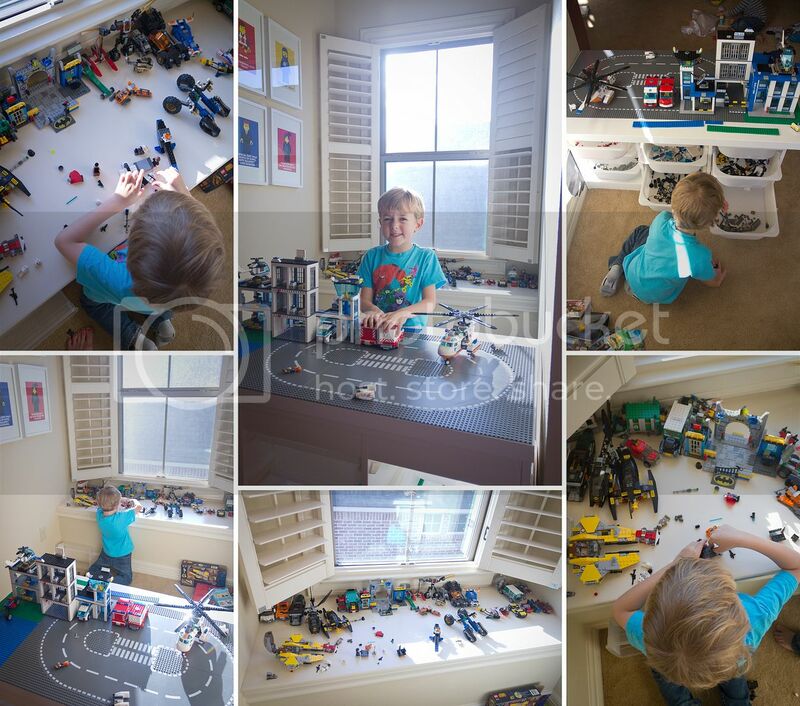 Finley and Braden are sharing a room now, and there's a little nook that's the perfect size for a Lego center. 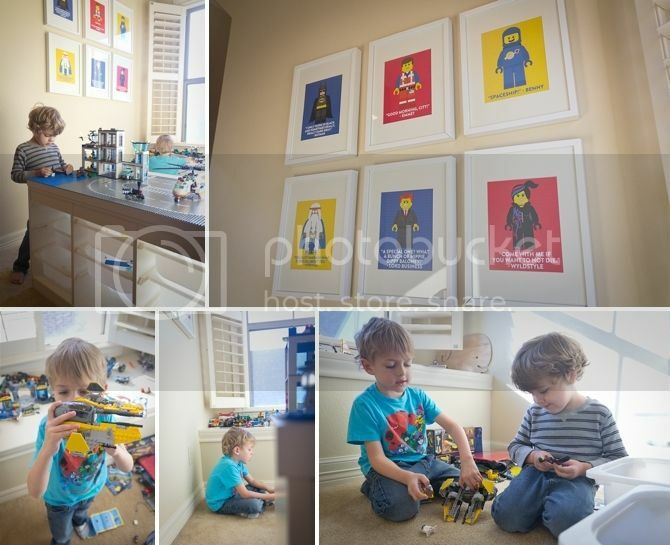 I made him a Lego table to (attempt) to keep him organized and hung up some Lego Movie prints I whipped up in Photoshop. I saw a bunch of cool tables on Pinterest and put this one together from an IKEA toy storage shelf and one of their countertops. Then we just glued some Lego plates on top. The Legos have also managed to take over the window seat as well. I seriously considered setting up a second table for him... but he doesn't need the storage, just the surface area. The storage bins are basically empty because I'm not sure he's EVER put a piece away. I'll sit down every so often and sort the miscellaneous he's pulled off... but its kind of a lost cause, which kills my Type A heart a bit every time. He loves playing with them so much--and I love to watch him build his own little creations and also be able to follow the directions. I'm glad he loves something that's (somewhat) educational. Braden and Keaton are both relatively good around them--Braden likes to play with them and rarely breaks them. And Keaton... well I don't think he's swallowed any, but we can't be sure. Braden's current favorite are the little Doctor Who set--which Finley will be quick to tell you, isn't actually Lego brand. But exciting news--Lego is coming out with a Doctor Who set later this year. It was really cute to watch him fly the little TARDIS around with Matt Smith and Amy! So Legos. So fun and also, so painful... on the feet and on the pocketbook. We haven't taken advantage of our proximity to Houston as much as we should--so when my cousin Nick let me know that our cousin Joey was in town visiting, that was all we needed to plan a quick day trip over! It's about an hour and a half drive--we spent the morning at the zoo before meeting everyone for some amazing tacos. The boys love the zoo--I think their favorite part is holding the maps and telling us where to go. I was trying to show Finley some animals and he told me he needed to "focus on his map." Priorities. 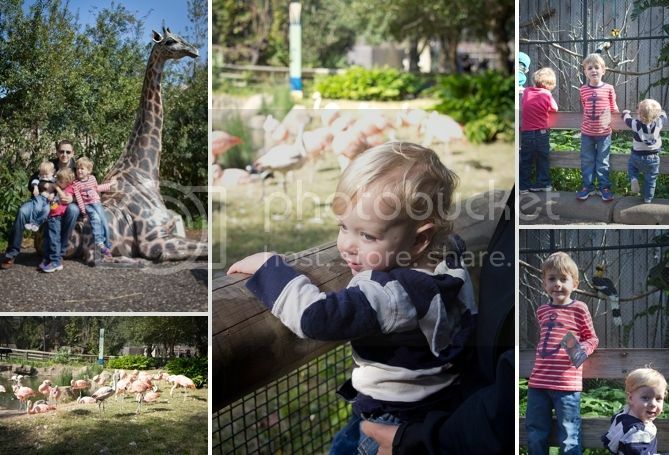 Braden mostly wanted to see giraffes (or "the Tuckers" as he calls them) and the zoo has a great platform where you can buy lettuce to feed them. The big boys loved it! 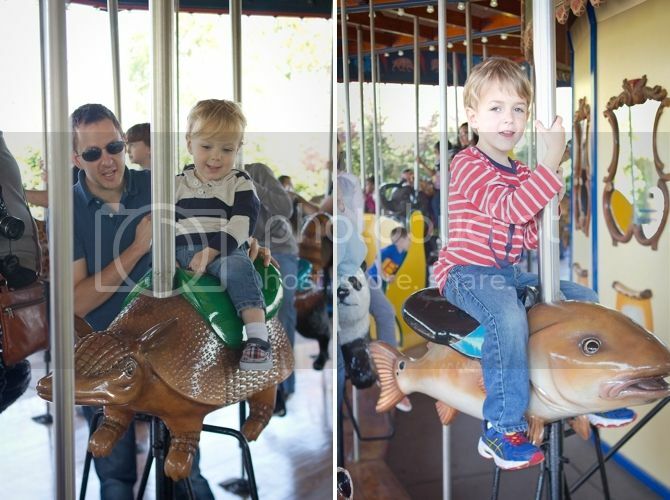 The carousel is so fun--the boys rode an armadillo, fish and raccoon. I mean, those are not your average animals. We've been reading the Kissing Hand a lot, so Braden was REALLY excited to ride Chester the Raccoon. Sweet smiley boy. 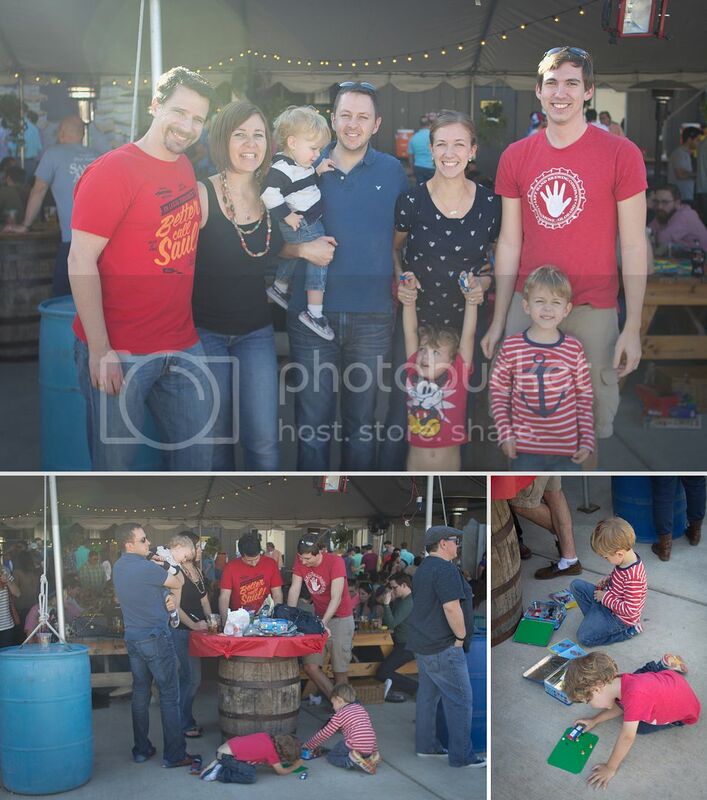 After seriously delicious tacos, we headed to the Karbach Brewery (yes, with our childrens) to hang out at a Beer Garden. It was a gorgeous day, so it was PACKED. The tables were filled with cool people playing games and eating snacks and responsibly drinking beer. We didn't ever find a table--so the boys played on the floor with their new Lego boxes I made them. Best time killers ever! Little metal lunch boxes filled with a new little set for each of them. It was so fun to catch up with Nick and Joey and meet Barbra! 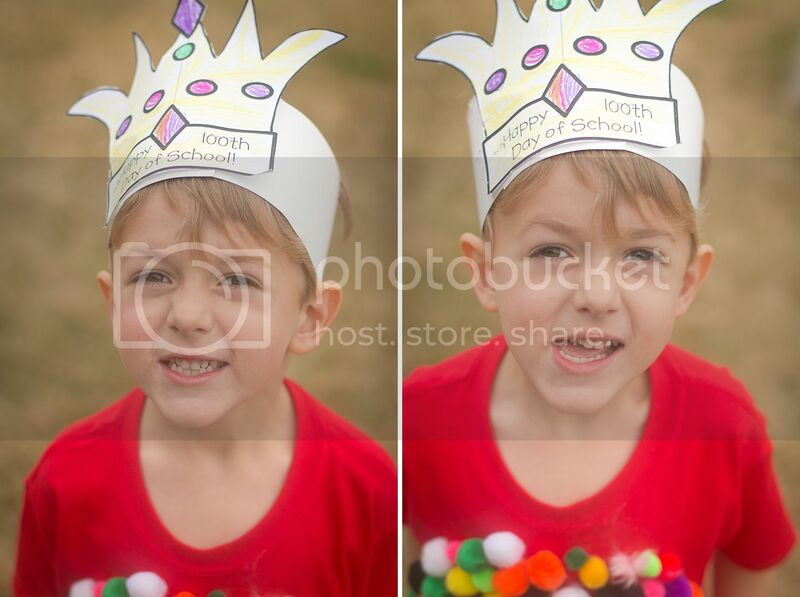 Finley's 100th Day of School was last week which apparently, is a thing. All the kids were supposed to make a shirt with 100 somethings on it. I turned Finley loose on Pinterest and let him pick something--naturally, he picked the house from UP. 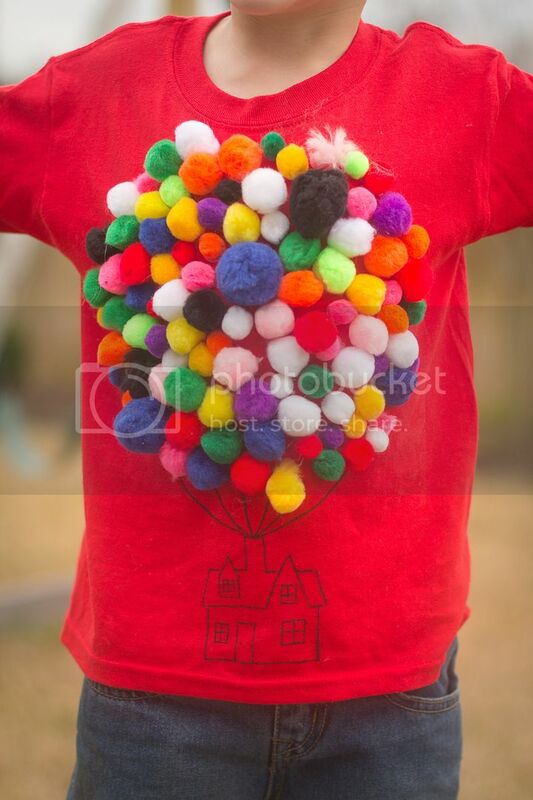 I put dots of glue on the shirt and he stuck the pom poms on--I only had to remind him a few times to NOT put ones next to each other that were the same color. And then, being the Type A mom that I am, I didn't let him draw the house. After like eight practice sketches, I finally put Sharpie to to shirt and drew it. And it wasn't too bad. 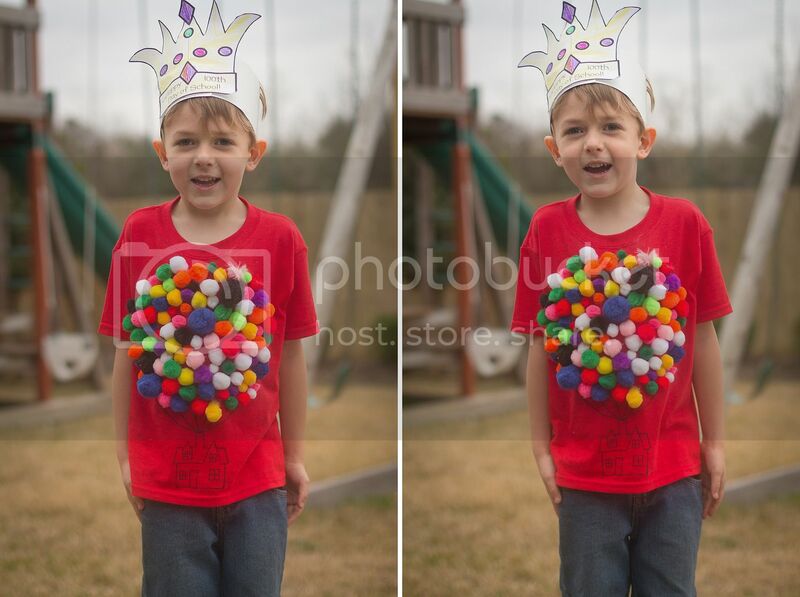 He really loved the shirt--and claimed that he won best shirt in his class and got a crown. Then he said that he won best boy shirt. Then he said everyone in another class won, so I really have no idea if he won or not, but I was really proud of us for a few minutes. Braden wanted to get in on the fun too--he's going through a Daniel Tiger phase and insisted on wearing a red "Daniel Tiger" shirt. 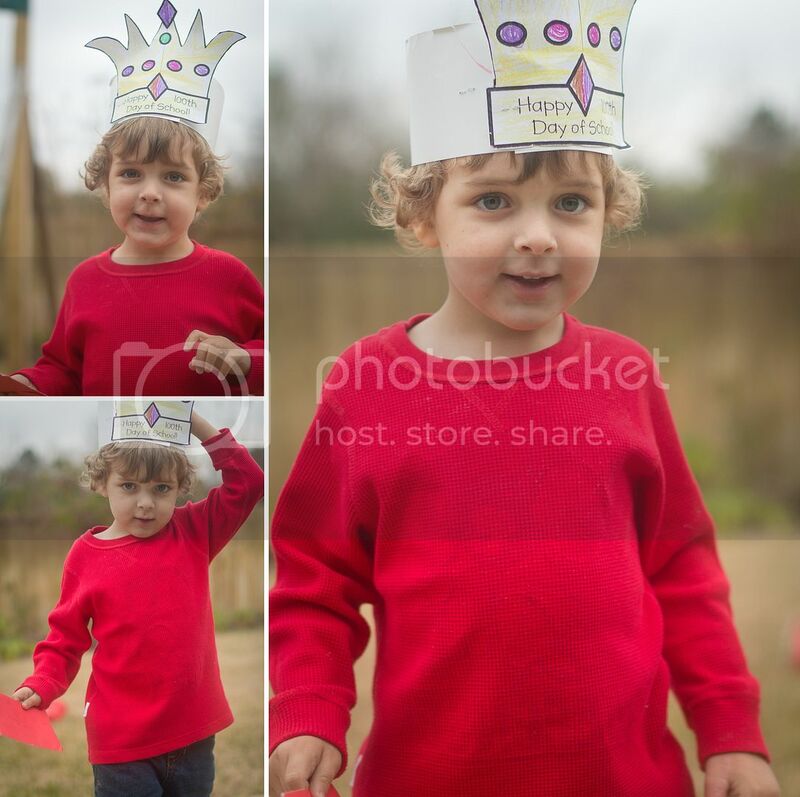 Isn't he cute? I kiss him a lot because his cheeks are still chubby. That Finley is like a bag of sharp sticks. And Braden is still like a sack of marshmallows.